Bedside laptop desk - Base thickness of this adjustable tray side table is only 15mm, which can put the bottom under the sofa. Overbed Table with Three-level shelf - Three-level shelf on the right side increased use space and more stablity to put book or other things. 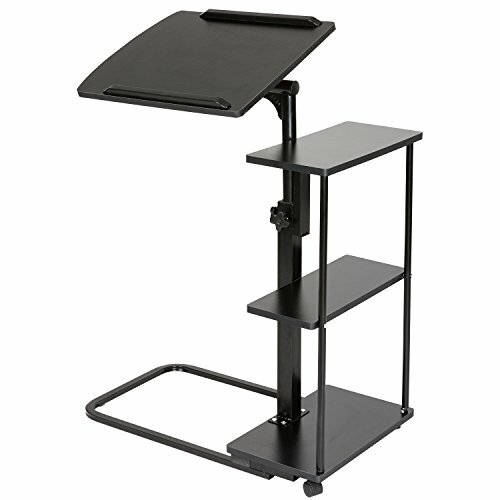 Laptop Cart - 2 moving wheels with stop plug makes this overbed table move anywhere as you wish. Adjustable Height and Tilt - Height adjustable from 27.56 inch to 37.4 inch, Tilting top surface allows you to view your laptop screen from any angle.